We could never do the good works we’ve been doing since 1970 without the help of a small army of volunteers. That’s where we collect, sort, price and pack books for the sale. We consider our Book Loft volunteers our “staff” and we seek their input as we have found that collecting the books (and the sale) is always a “work in progress.” The busiest days for us at the Loft are Tuesdays and Thursdays from 10 a.m. to 3 p.m.– but we are also open Wednesday from 1 p.m. to 7 p.m. and Saturdays from 10 a.m. to 3 p.m. If we have the staff to support it, we could be open more hours. Our volunteers range in age from 20 to 90+. We come from all walks of life, and we share in common our mutual love of books. There are many different tasks available at the Loft, and volunteers often find one task that they are particularly suited for, but everyone is welcome to perform a variety of activities. Triage Books come in to us jumbled in boxes, bags, loose in the trunk of someone’s car,(we have shopping carts for those donations.) and in the big canvas rolling cart from our on-site book drop. People working “triage” sort the books into some basic categories (hardcover, paperback, children’s), box them and deliver to those departments. This is often a fast-paced and fun environment to work in, because you just never know what’s going to turn up in those donations. Children’s Books We handle literally tons of children’s books– from the antiquarian to the latest titles; block books, picture books, chapter books and books for teens. People working with Children’s books sort them into different categories and price them accordingly. Most of our books have “unit” pricing, which speeds things up a bit. If you love kid’s books, we’d love to meet you. Paperbacks The paperback room is a hive of activity, with sorters pricing and sorting books according to size and topic. We get in tens of thousands of paperbacks each year and each one needs to be priced and packed into the category where buyers can find them– mystery, science fiction, romance and trade fiction. Hardcover Books As in the paperback room, hardcover sorters also sift through boxes of books, pricing and dividing into separate categories and delivering the books to their appropriate sections in the packing room. Collectible Books We are always on the lookout for books that are rare, scarce and collectible. This is an area that needs a little expertise, but if you’re interested in learning about collectible books, we can show you the ropes, too. Books are deemed collectible by a number of factors, most titles are verified by research through various online sources. Most of our “collectible books” are sold in our “Collectible books” section at the sale. Books that are highly sought-after are offered through Silent Auction at the sale, and some books are sold online. Conservation It’s not unusual for us to be given antiquarian and collectible that need a little repair. We are always looking for people who can help with mending dust jackets and pages, re-glueing spines, cleaning older books, wrapping jackets in mylar covers and other basic book repair tasks. Online Sales We do sell some of our more unusual titles through our online stores at eBay and Amazon. If you have experience with online sales, or you’d like to learn how to sell books online, come and see us. Media In addition to books, we also sell vinyl records, CDs, DVDs, VHS and select magazines at the sale. If this is an area of interest to you, we have stuff for you to do. Like our other materials, these too need to be sorted and priced and sometimes researched. Packing & Storage Are you a whiz at packing books? Our books are separated into approximately 40 different categories and packed into 20″ by 24″ by 16″ cartons (which weigh approximately 40 pounds). Packers need a good spatial sense and while it’s useful if you can lift 40 pounds, it’s not essential as we generally have someone around who can. Boxes go from the packing room onto skids in the pallet room. From there, full skids are wrapped in stretch film and then moved in groups of 12 skids to the warehouse. Hospitality We keep a stocked fridge, kitchen cupboard and candy jar at the Loft. We also do our best to acknowledge birthdays and other important events and we have a couple of staff luncheons through the year. (We break for lunch every day, but sometimes we bring the lunch.) If this is right up your alley, we’d love to have someone keep an eye on food and drink at the Loft, and pick up the birthday cakes, cases of water, cans of coffee, carton of half & half, boxes of fruit and bags of candy as needed. Outreach In addition to selling books, we also give away cases of books through Dave Hurwitz’ literacy project and to schools, clinics, community kitchens and anyone else who needs them. We’d love to have more people finding more places for us to give away books as well as more sites for our book donation barrels. Additionally, we try to meet with area Assisted Living facilities to leave our brochure for their new clients, and of course, we are involved with our beneficiaries in mutual promotion of our Book Round-Ups and Sale. Book Pick-ups We could use more drivers to pick up the books from our collection barrels and to also visit donors with especially large collections (or any size collection– if they need our help, we provide it) to help pack and collect their book donations. This involves travel around the greater Dayton area– and we have applied for a grant to help offset gasoline costs. If you’d like to know more about any volunteer opportunity, or if you’d like to come in and see the place for yourself, give us a call at (937) 999-4491. We always need volunteers for the Book Fair. This year the sale is Friday, November 9th through Monday, November 12th, but we’ll be starting set up the Monday before, November 5th– and we’ll be looking for people with strong backs to help get books unloaded from pallets and unpacked onto their appropriate tables. Through the sale we need stockers, packers, and people to assist with check-out. Mark your calendar now. I can volunteer. I work around the corner at the Boonshoft. Wednesdays would be good for me. I can probably help at the sale as well. That would be marvelous! If you are able to, come by and see us this Sunday afternoon from 1 to 5 (it’s our Volunteer Open House) and if not, stop in on a Wednesday to see us. Ask for Larkin. Many thanks! What bus line & closest stop? I’m new back to the area & everything has changed a lot in 23 years. There is a bus stop close to the Book Loft, at the corner of Keowee and Embury Park. It’s bus route 22. Stop in and see us. Will you be selling the Harlequin type books in bags as you have for several years now? Will you be selling the Harlequin paperbacks in bags as you always have? Teri, we will have both “loose” Harlequins on the table, priced either 50 cents or one dollar and we will have sealed cartons of Harlequins, approximately 100 per carton, for $5. 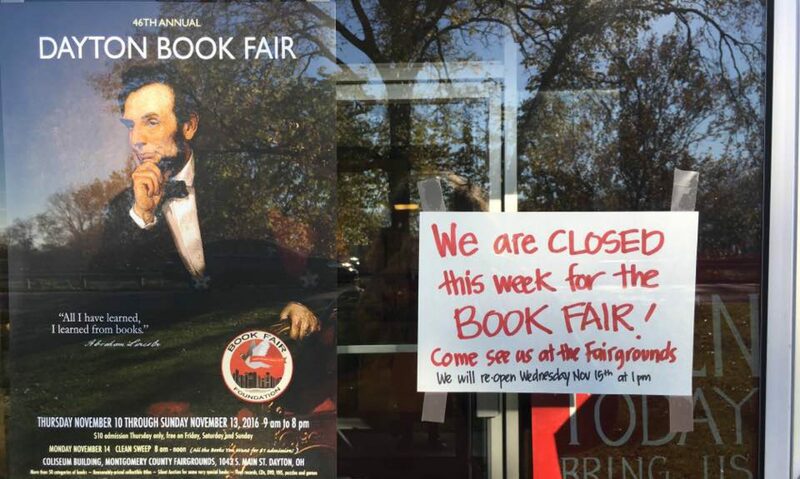 And on Monday morning, for a $1 admission charge, you can take all the books you want. hello I can volunteer on weekends and some nights during the work week. I am interested in volunteering at the Book Loft (probably on Saturdays) and I am wondering what I need to do to become a volunteer? Would it be possible for me to volunteer?